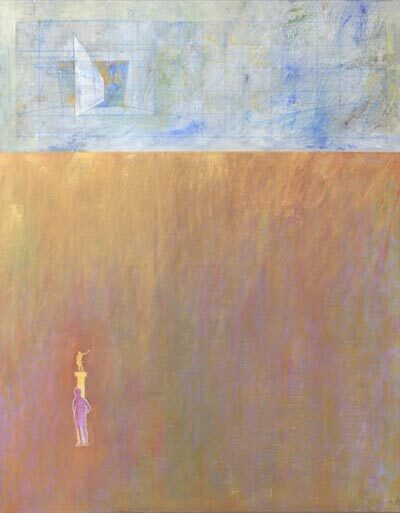 The Artworks blog today ‘takes five’ with the artist Anthony Jones, one of the newest members of Artworks. Anthony often works in series, switching from figurative to abstract, choosing the medium, method & style most suited to the theories and ideas that underpin the project. Anthony originally trained as a graphic designer, working successfully in that field for many years before deciding to pursue a fine art degree at Salford University. As the Artworks ‘take five’ series goes, we begin by asking some simple questions. It’s informed, colourful, dynamic, controlled and well-crafted. Do you have a favourite colour – and what’s the reasoning behind it? The colour blue. It offers most things I want in my life… security, serenity, light, excitement, scholarship, spiritual fulfilment – amongst other ‘qualities’. What is the oddest thing someone has said in response to seeing your art? 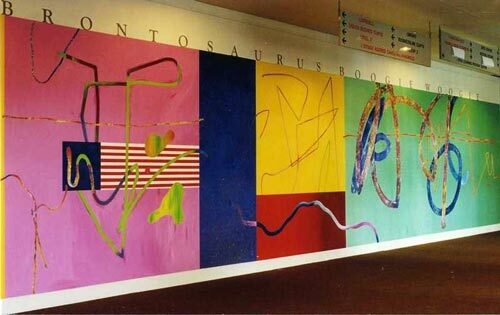 “If I did something like that in our living room, you’d thing I was mad wouldn’t ya…” Husband to wife as they were walking past the mural I painted in an Arts centre foyer, ‘Brontosaurus Boogie Woogie’. 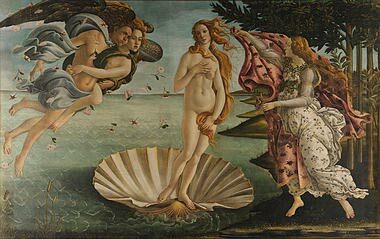 Which living artist do you most admire and why? 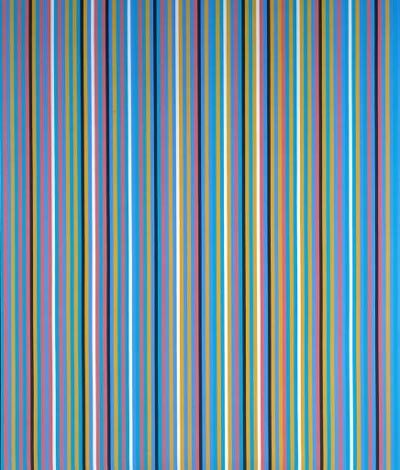 Bridget Riley. There is beauty in her work, colourful, organised yet wild! 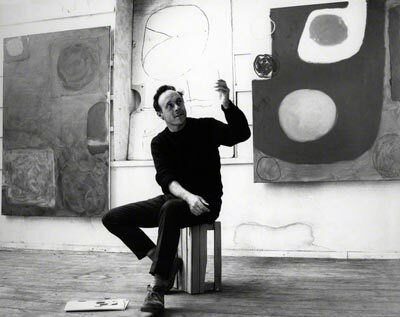 I also admire the work of Patrick Heron. 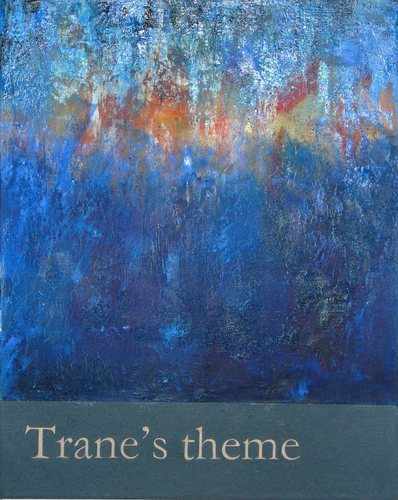 Although he was asthmatic, which I am, and his wife passed away in about 1980 (mine died in 2001) his writings, intellect and sense of colour are fundamental to many of the views I share on creativity. 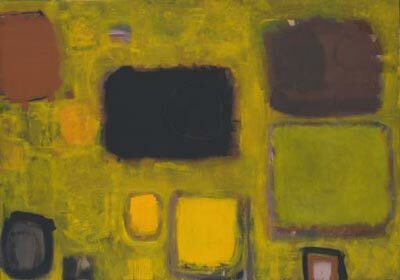 Heron’s work in the 1950s, 60s and 70s influenced my own sense of design, colour and composition for ever. I also liked his sense of pride in British Art of the first and second generation St Ives painters against American cultural imperialism of the 1950s. He dressed, in later years in similar colours as he painted with! I have also visited Eagles Nest, Patrick Heron’s house in Cornwall. Share something unusual you’ve learnt from looking at the work of other artists. Look closely, especially at the edges. How do you generate or develop ideas for your own art? They generate me, they are a response to something I see, hear or smell or read. So, how do come about or decide on the titles for your work? I think they should be fairly direct and simpler rather than obscure or pretentious. If the title becomes too burdensome or long-winded, then it’s arguable that it should be part of the artwork itself. If artworks are guns, then the titles could be classed as their triggers, waiting to be pulled by the viewer. Could you describe your studio space set-up. What’s the purpose of drawing for you as an artist? It’s the graphic materialisation of an idea, and an exercise in developing how to look and possibly record. What single piece of advice would you give to an aspiring or young artist? Learn how to draw well. And, if you had to choose between using a pen or a pencil to draw with – which one and why? Pencil. I am used to it, it’s versatile, it can can be delicate or it can be bold. Which famous artwork would you most like to own, if money & space was not an issue? Gwen John’s ‘Teapot on a tabletop‘, a small oil in Manchester Art Gallery, or ‘Cottage in a Cornfield‘ by John Constable or ‘Birth of Venus‘ by Sandro Botticelli. Could you tell us about a work of art (contemporary or historical) that you don’t like – and why? 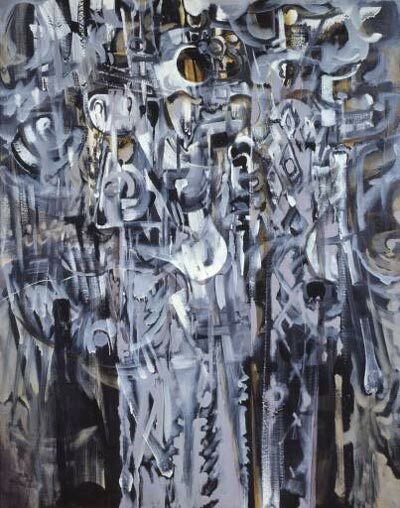 Anything by Bryan Wynter (a contemporary of Patrick Heron), it disturbs me too much, like a bad dream I used to have. Why do you need to make art? It is essential to my personal well-being. What do you think is the role of an artist in contemporary society? A fantasy question to round off this ‘take five’ – which artist would you invite to dinner and what question/s would you ask them? A great question to conclude with, thank you for taking time out for the Artworks blog! To read more about Anthony’s work, head on over to his Artworks artist profile page, or see more of his various art projects on his own website: ajayeart.co.uk. This entry was posted in artworks news and tagged anthony jones, artist interviews, artists, artworks, east anglia, exhibition, paintings on June 29, 2011 by admin.